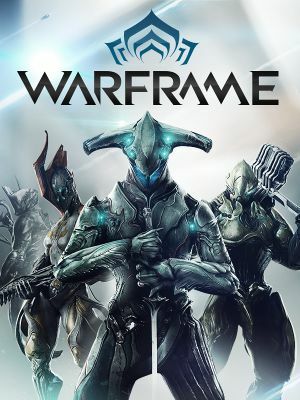 Linux users who wish to run this game on Proton should rely on Warframe-Linux which contains special patches made specifically for this game. 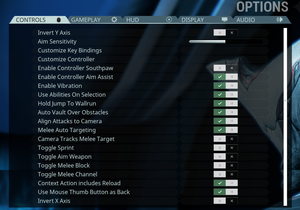 All versions require a Warframe account and a constant internet connection for all game modes. Launcher settings, found by clicking the gear icon in the top-right. 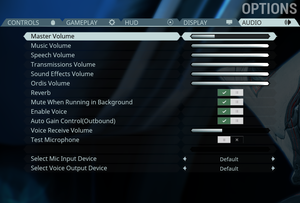 Set Display Mode to "Borderless Fullscreen" in-game. TAA 8X (High), SMAA (Medium), FXAA (Low), and Off. DirectX 10 or DirectX 11 can be enabled using the game's launcher. Multi-threaded rendering can be enabled using the game's launcher. 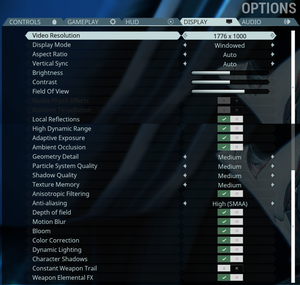 Gore can be toggled on or off in the "Gameplay" settings menu. Master, Music, Speech, Transmissions, Sound Effects and Voice Receive. Uses native Windows speaker configuration (set in mmsys.cpl). Cannot be disabled. May sometimes appear when not desired for some specific audio lines. Four player PvE co-op. Eight players only supported in PvP and specific PvE missions (trials/raids. NOTE: trials/raids have been removed from the game for an indefinite amount of time). An unknown large number of players can join region-based dedicated Relays (player hubs). Allows for solo play, as well as invite-only, friend-only, and open matchmaking based on mission selected. Always online. Most gameplay is hosted peer-to-peer. Relays (player hubs) for PvE only, with no combat. Depending on region and availability, Conclave (PvP) can be hosted by a player-hosted dedicated server. Starting a session alone and with no other players (via matchmaking or otherwise) will cause you to be the host. Otherwise, hosts are automatically determined by who has the best connection. Leaving a game as a host will cause a host migration to the next player with the best connection in the party. Icons determining player order/who is host are shown on the HUD. There's an in-game setting that allows you to change to 4950 & 4951 and so on, up to 4998 & 4999. 10, 11 Choose in launcher. ↑ File/folder structure within this directory reflects the path(s) listed for Windows and/or Steam game data (use Wine regedit to access Windows registry paths). Games with Steam Cloud support may store data in ~/.steam/steam/userdata/<user-id>/230410/ in addition to or instead of this directory. The app ID (230410) may differ in some cases. Treat backslashes as forward slashes. See the glossary page for details.